The featured event to kickoff Chicago Artists Month is at Ravenswood ArtWalk, 4011 North Ravenswood, this Friday from 7 PM To 10 PM. There will be art, food, music and more at the Opening Night. Sample the fare and meet many of the 250 artists who are showcasing their work in the Ravenswood Corridor throughout the weekend. Admission is free. Hundreds of your closest friends and neighbors! 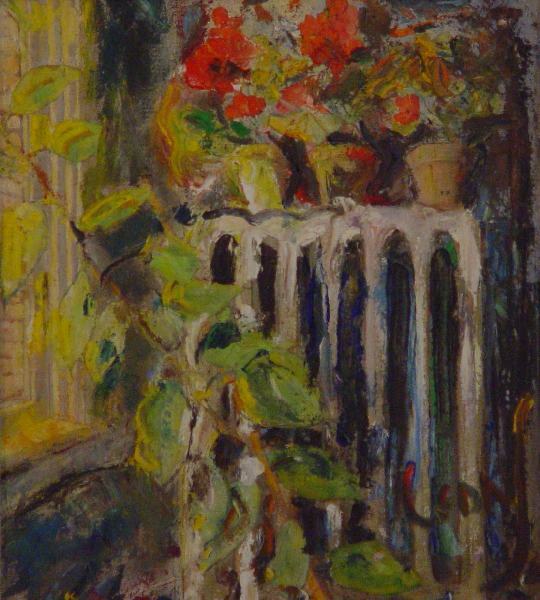 My painting, Three Potted Geraniums, is displayed at the opening reception. It portrays a scene from my Chicago apartment with a vintage feel and is available for purchase during the Artists Salon and Silent Auction. Many Ravenswood ArtWalk artists are displaying one artwork each at the Central Gallery at 4021 N. Ravenswood over the weekend. It’s open this Saturday from 11AM to 7PM and this Sunday from 11AM to 6PM. My non-objective painting, Mexican Roadtrip, is on exhibit there. The painting captures the feeling of the life and colors of Mexico using bright primary colors with heavy textures, washes and linear overlays. It was an ArtSlant Showcase winner this year. More of my paintings are on display for the weekend on the first floor at 1802 West Berteau Avenue (- on the Northwest corner of Berteau and Ravenswood). So far I am planning to display two paintings from my Organic Creatures series, and Still Life With Mannequin Hand. 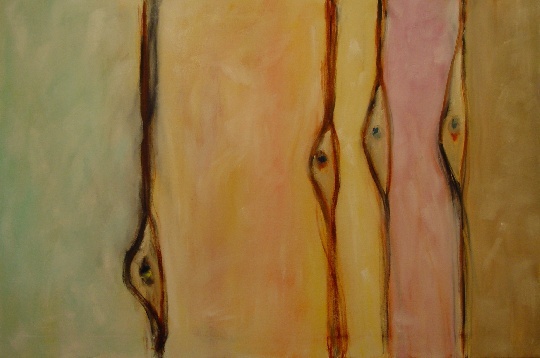 Organic Creatures Going to the Beach is a whimsical abstract painting with soft colors in pastels of green orange, yellow, and pink with strong, vertical,brown lines. It suggests to me a strange family of beings on an outing. Organic Creatures Taking the White House Tour is another abstract painting in this series. Much of my work is very planned, deliberate, and slow to evolve. At some point, I like to stop work on such a piece and do another painting that I almost attack with energy and colors, with none of the deliberation of my usual approach. 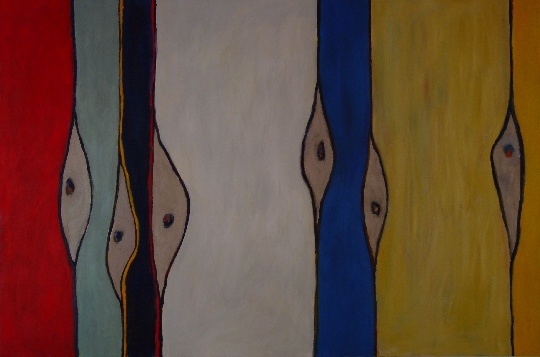 This abstract, Organic Creatures Taking the White House Tour was one of these quick paintings in vivid primary colors. I actually envisioned it in an instant behind my eyelids as I was rubbing my eyes after some tiring work. I tried to apply the image to canvas quickly, adding all kinds of color and quick composition, while keeping the main figures true to my vision. When finished in about 2 hours, I looked at the finished piece and felt that here were some strange creatures doing something, and sensed that they were on a sightseeing tour. I picked the title with a sense of humor. I would enjoy doing more oils of this same family of creatures moving about in different settings. 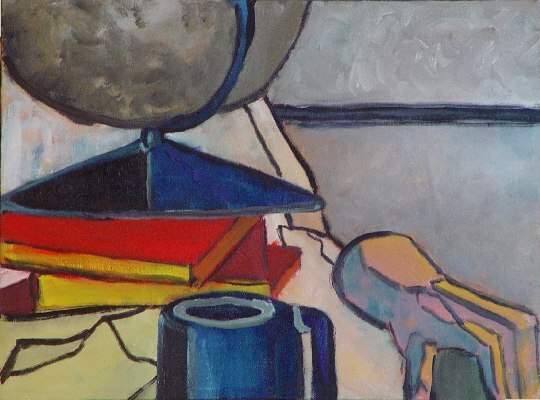 Still Life With Mannequin Hand is one of a series of paintings in which I am developing an artistic approach that combines abstract and representational art. The objects and shapes in this still life are readily recognizable, but are portrayed in a stylized manner with outlines in strong black lines. 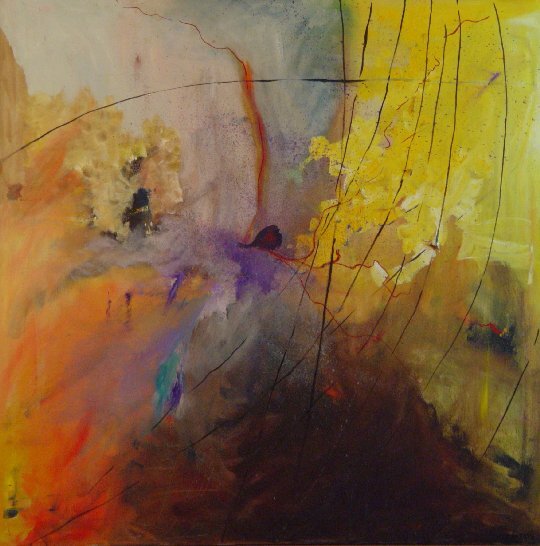 An atmosphere of tension pervades the painting. The globe is perched unsteadily on a pile of books, while the mannequin’s hand leans somewhat precariously over the edge of the table. This painting won Best of Show award at Cornerstone Art Center & Gallery for the Value, Volume and Variety Exhibit in Whiting, Indiana in May of this year. There will be many events at Ravenswood ArtWalk this weekend, but I’m especially pleased that my brother, John Sarantos, will be playing Native American flute music at the main stage – this Saturday at 1:15PM. The entertainment is part of the RAW Street Fair on Ravenswood Avenue between Montrose and Sunnyside Avenues, a block filled with art, food and drink, live music and activities for adults and kids alike. The “For the Love Of Art” street fair will take place on August 27, 2011 in Whiting, Indiana. The vendor application is available on the website www.119streetartists.org.